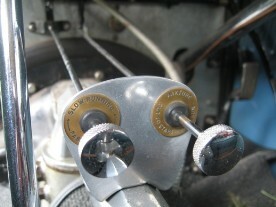 These are manufactured in-house by Vintage MG Parts with the exception of the CNC machined knobs which are of chromed brass and are produced here in Yorkshire. We have kept a meticulous eye on detail copying an original set. The rods are produced in highly polished imperial size stainless steel rod. We also stock the moulded knobs and rods for P and N Types.